ScriptableObject, according to Unity, is a class code that allows you to make Scriptable Objects in your game to store large quantities of shared data independent from script instances. There are a number of reasons to use Scriptable Objects in Unity. They can increase your workflow, reduce memory usage and even decouple your code architecture. 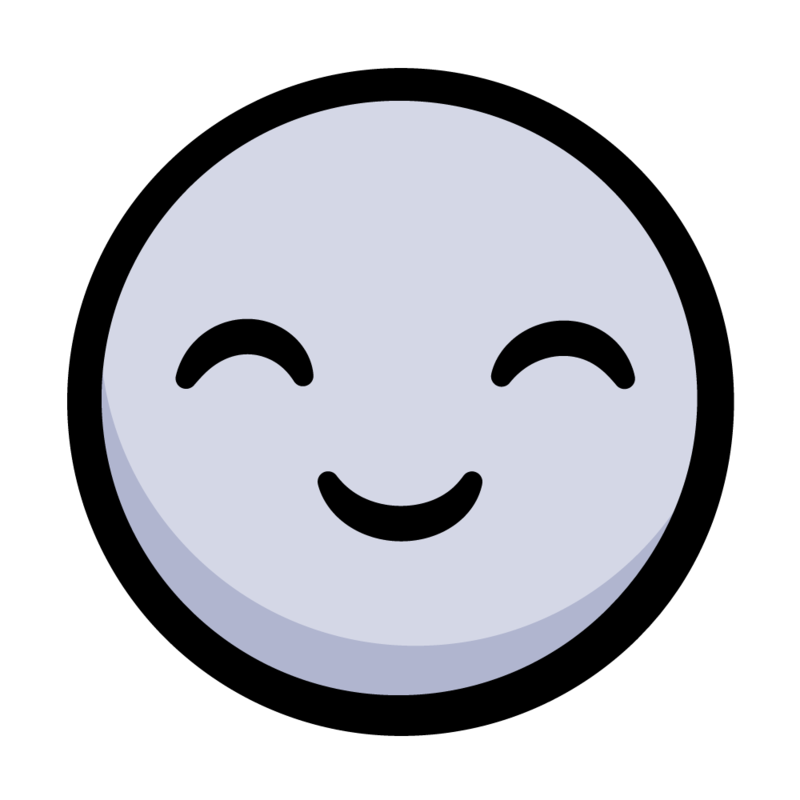 You will also lighten the memory usage of each extra prefab instance because, at its core, a Scriptable Object follows the Flyweight design pattern. Another benefit of Scriptable Objects, which will be the focus of this tutorial, is using them to swap out data with ease. You’ll be doing this through creating a Sword Merchant shop that will display different stats, costs and descriptions for various swords. In this tutorial, you’ll learn how to create and use Scriptable Objects in Unity. Note: This tutorial assumes you know your way around the Unity editor. You should know how to edit code in a code editor and have a basic knowledge of C#. If you need to sharpen your Unity skills, check out some of our other Unity tutorials. Start by downloading the materials you’ll need using the “Download Materials” link at the top or bottom of this tutorial. Next, extract the download to a location of your choosing and open up the Scriptable Object Tutorial-Starter project in Unity. _Setup: For this tutorial, you won’t need to go into this folder at all. Scenes: Contains the Sword Merchant scene that you’ll occupy for the entirety of this tutorial. Make sure you’re in this scene now. Scripts: Currently houses one lone script, but you’ll add more during this tutorial. 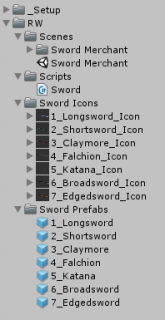 Sword Icons: Contains a still image of each individual sword. 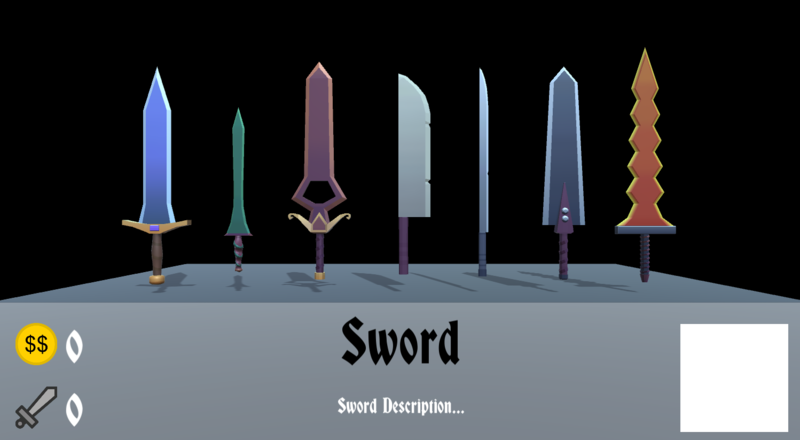 Sword Prefabs: Contains a prefab of every sword in the Sword Merchant scene. It’s time to make your first Scriptable Object! Under the Scripts folder, create a new script called SwordData. This class will be used as a container for all the sword data that will display in your Sword Merchant shop. This action tells Unity that you still want to use Unity features and methods, like a typical MonoBehaviour, but you’ll no longer need to put this script onto a GameObject. Instead, it will be treated like any other common asset that can be created, similar to creating a prefab, scene or material. Fill this script with some serialized fields that will contain all the data, corresponding with the information displayed on the Sword Merchant UI. swordName: A string to hold the name of the sword. description: A string to hold the description of the sword. 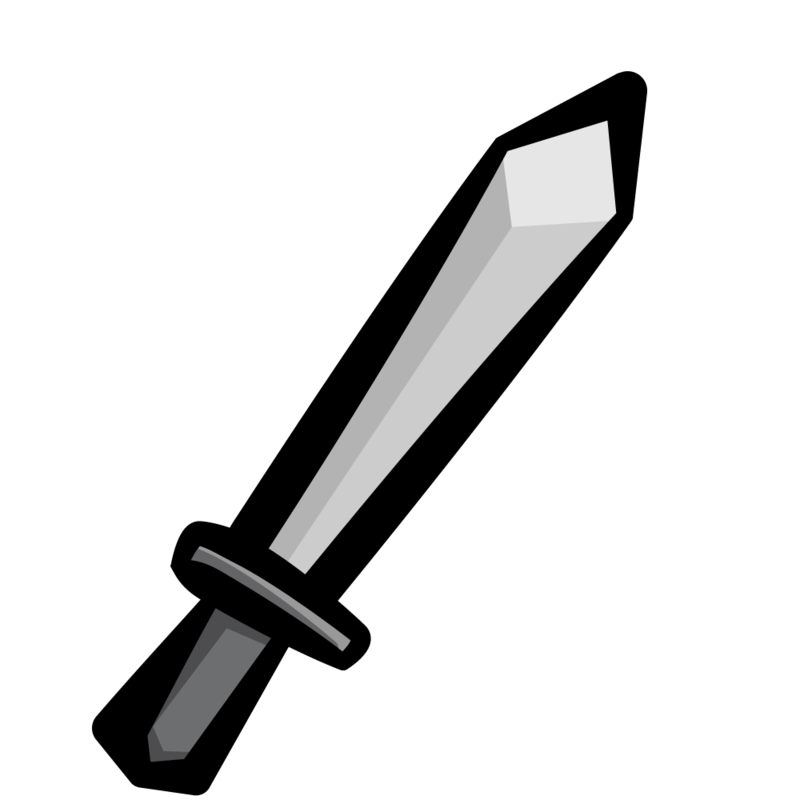 icon: A sprite to hold the icon of the sword. goldCost: An int to hold the gold cost of the sword. attackDamage: An int to hold the attack damage of the sword. In Unity, the SerializeField attribute allows you to have private script variables that are exposed in the Inspector. This will let you set the values in the editor without giving access to the variable from other scripts. 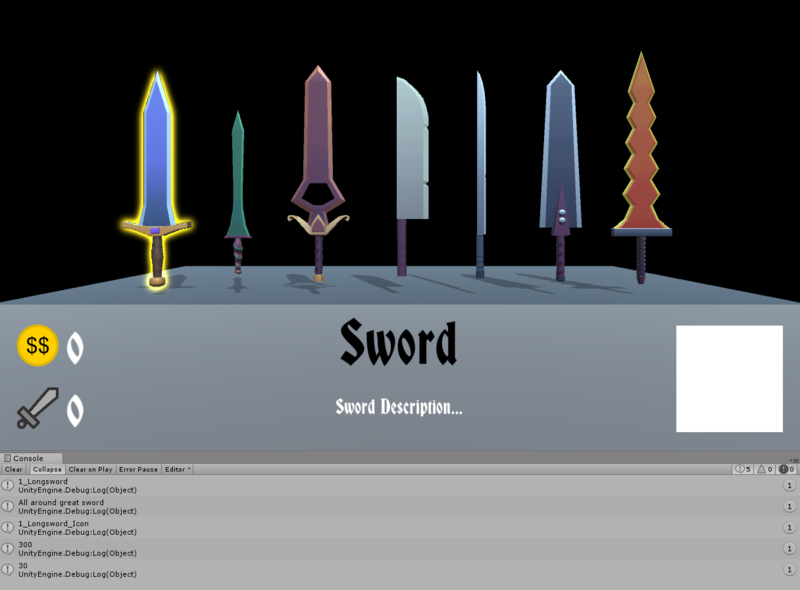 Each sword will need it’s own unique implementation of the SwordData Scriptable Object. But before you can create these implementations, you will need to add your Scriptable Object to the Asset Menu. fileName: The default name when the asset is created. menuName: The name of the asset as it appears in the Asset Menu. order: Where the asset will be located within the Asset Menu. Unity separates assets into sub-groups by factors of 50. So 51 will put your new asset in the second grouping of the Asset Menu. Stay organized by creating a folder under your Scripts folder called Scriptable Objects, and then another folder inside of tha Scriptable Objects folder called Sword Data. 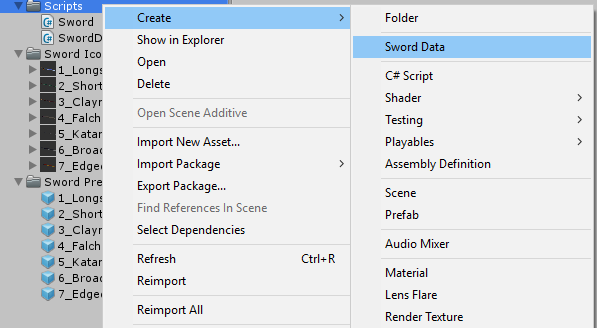 Inside the newly created Sword Data folder, create your first Sword Data asset. Congrats! You’ve created a Scriptable Object and set up various assets using that Scriptable Object. Now it’s time to get the data from these Scriptable Objects. The data container for this sword’s data. OnMouseDown is a built-in MonoBehaviour function that will be called when the user clicks the mouse. You should see console output resembling the data provided from the Sword Data asset. Scriptable Objects allow you to swap out this data with ease. 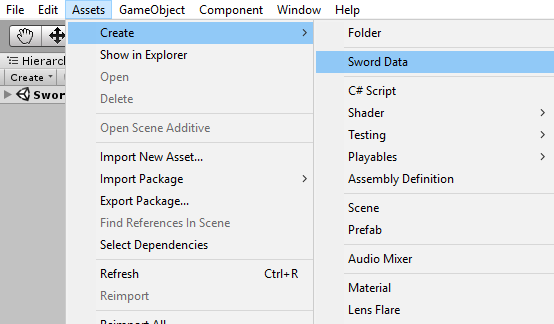 Go ahead and put different Scriptable Object Sword Data in that sword’s Sword Data field. That was a lot of swords… Here! Have another! Alright, so you’ve created a Scriptable Object, and you saw how you can access its data in-game. But you still need to integrate your Sword Data with the UI! …which is Scriptable Objects! Use it to your advantage to create nice, clean and decoupled code. For this section you’ll learn how to create Game Events utilizing the UnityEvent class. Under the Scripts folder, create the following two scripts GameEvent.cs and GameEventListener.cs. They both depend on each other, so you’ll need both before any errors are cleared. Adds the GameEvent as an asset on your asset menu. The GameEvent is a Scriptable Object so it needs to derive from ScriptableObject. A list of GameEventListeners that will subscribe to your GameEvent. A method to invoke all of the subscribers of a GameEvent. The last GameEventListener to be subscribed will be the first to get invoked (last in, first out). A method to allow GameEventListeners to subscribe to this GameEvent. A method to allow GameEventListeners to unsubscribe to this GameEvent. Required to use the UnityEvent class. The GameEvent this GameEventListener will subscribe to. The UnityEvent response that will be invoked when the GameEvent raises this GameEventListener. Register the GameEvent to the GameEventListener when this GameObject is enabled. Unregister the GameEvent from the GameEventListener when this GameObject is disabled. Called when a GameEvent is raised causing the GameEventListener to invoke the UnityEvent. …my brain. That was a lot, but it will all come together! 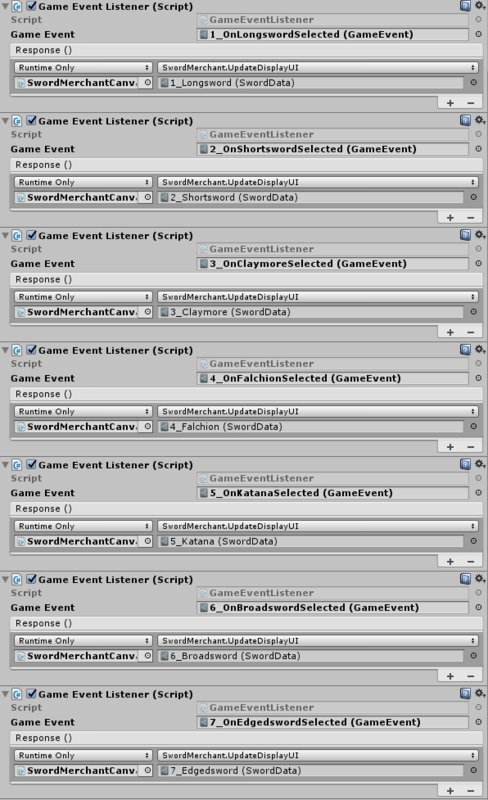 Return to the Unity editor and create a new folder called Game Events underneath Scripts >> ScriptableObjects. 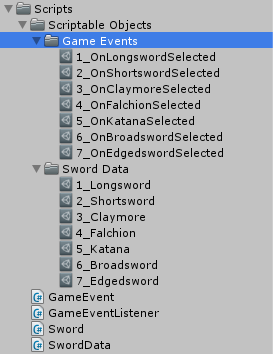 Then create seven Game Events from the asset menu, just like you did for each Sword Data asset. Place them under the new Game Events folder. The Game Event to be raised when this sword is selected. Will raise the event when the sword is clicked. Save the script. Then, under each sword GameObject in the Hierarchy, link the appropriate OnSwordSelected event. Each sword now has a reference to an event that will be raised when the sword is clicked. It’s time to get that UI working. The goal is to display the correct Sword Data for each sword that is clicked. A reference to the Text component of the NameText GameObject. 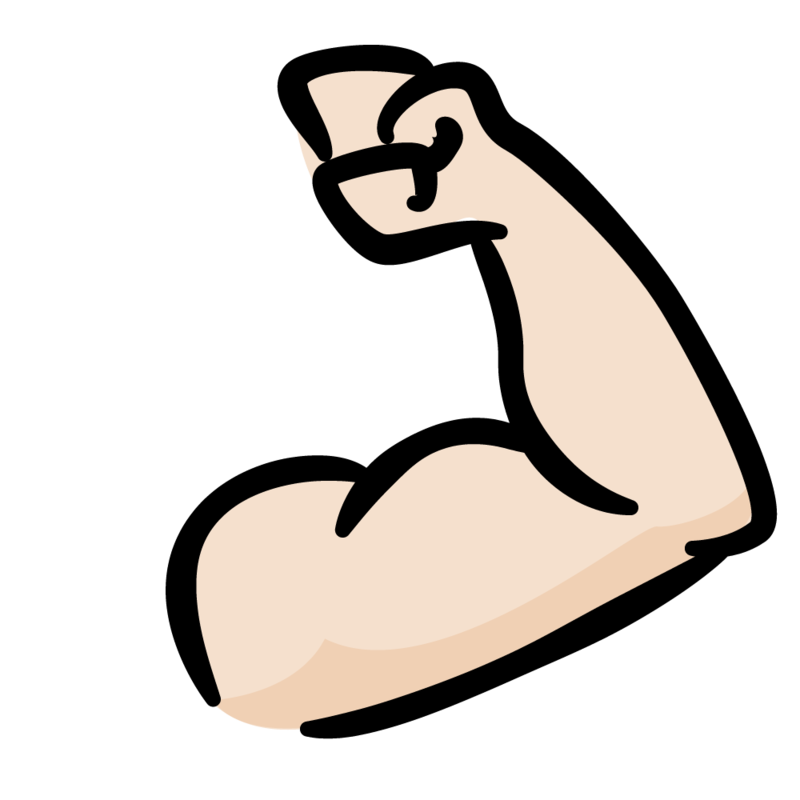 A reference to the Text component of the DescriptionText GameObject. 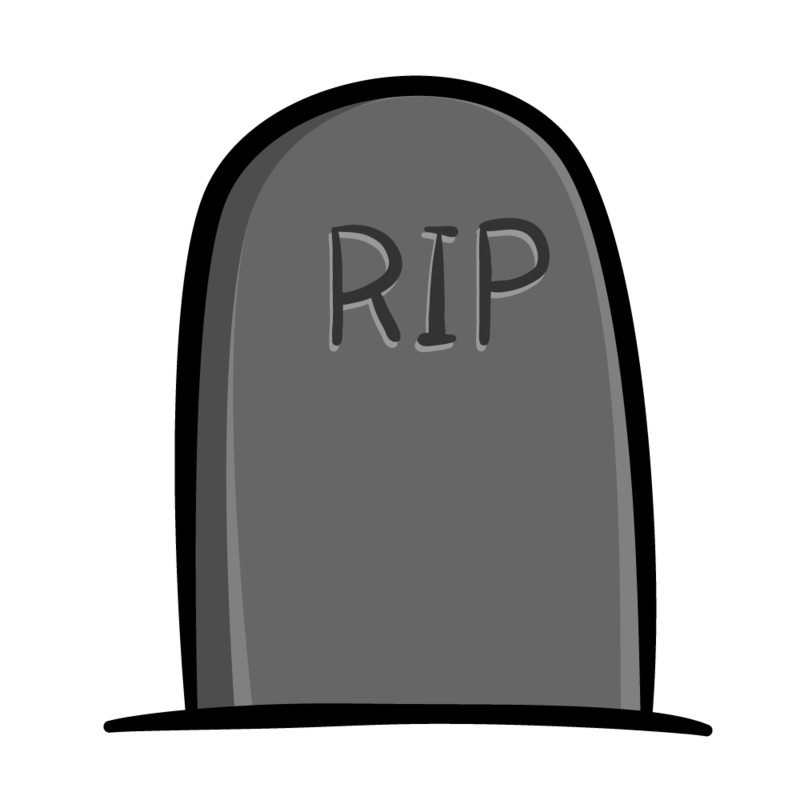 A reference to the Image component of the Sword_Icon GameObject. A reference to the Text component of the GoldText GameObject. A reference to the Text component of the AttackText GameObject. As you may have noticed, your Game Event Listener has two fields: A Game Event that it listens to, and a response that it will invoke when the Game Event is raised. This method takes in a Sword Data asset, and then updates each UI field to the corresponding Sword Data field. Notice GoldCost and AttackDamage return an int so you need to convert that to a string for the text. With your new method, you can add a response to each GameEventListener. For each response you add, you’ll need to set the None (Object) field to a reference to your SwordMerchantCanvas GameObject. After this, select SwordMerchant.UpdateDisplayUI from the drop down menu to the right of the drop down listing Runtime Only. Be sure to use the correct Sword Data asset for each OnSwordSelected event. You should be able play the game, click on a sword and see the UI update accordingly! If you missed anything along the way, you can download the final project for this tutorial using the “Download Materials” link at the top or bottom of this tutorial. If you’d like to go a step further, try to make each sword play a different sound. Try extending the Sword Data Scriptable Object and listening for the OnSwordSelected GameEvents. Looking to learn more about Unity? Watch our Unity video tutorial series or read our written Unity tutorials. Feel free to ask any questions or leave any comments in the discussion forum below.